Next message: [TRNSYS-users] How to best model zones in zones? 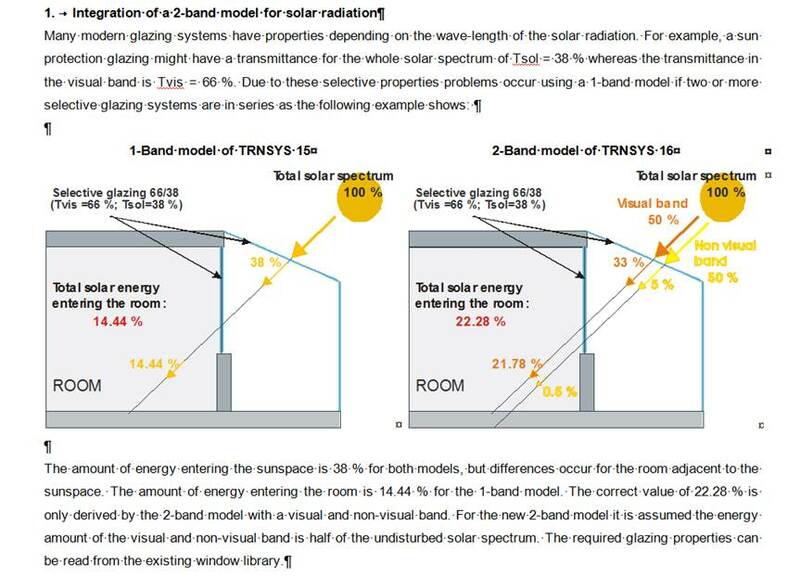 the 2-band model only makes a difference when solar radiation is passing through two selective glazing systems in series. This is an old example with a visual fraction of 50%. This visual fraction isn't used, but the exmaple explains the fact well. I hereby post a late answer to an old issue thanks to Hanisch: see below. I take this opportunity to ask a question concerning the 2-band radiation calculation. Since non-visual glass properties are computed based on solar and visual properties assuming a constant visual / solar radiation ratio (0.466) I don't understand how a simple calculation with solar properties only (1 band) would lead to different results regarding transmitted solar radiation. By the way when I compute the diffuse transmittance as QSTRNS/QSEXT for QSEXTBeam=0 I get the exact same value as the hemispheric solar transmittance (Tsol Hemis) from the WINDOW data, whatever the value of the visual transmittance. Could you please explain how and why the 2-band calculation could differ from 1-band calculation? our lokal TRNSYS-hotline (Transsolar) told us, that TRNSYS uses a different solar-spectrum as windows. So for glazings with high selectivity negative values for visible transmission can accour. For solving that problem, they advised to make a one-band rather than a two-band calculation for the windows used in TRNSYS. To do so, in winlib.dat (as well as in prgwin.dat) the angle dependent values for solar-transmission and reflection  should be copied to the values of visible transmission and reflection. In my case the difference between the two-band calculation (with the warning) and the one-band calculation was about 4%. The problem should be solved in TRNSYS V18. Sorry no further insight on that matter. I let it go considering the rather low discrepancy between calculated and maximum value. If you get any other information though don't hesitate to let me know. I have the same Problem with TRNSYS as you reported in the TRNSYS-mailing-list in April (see below). If so, would you be so kind to tell me your way to solve the problem. values encountered in Window-ID        116. for an angle of    0 °. 0.561! Please check your window data!